This looks like an excellent summary showing how to use Motion to create time lapse video. I’ll have to try it out on my Raspberry Pi sometime. I had some time recently to be able to mess about with motion which is a free, open source, software motion detector. I’ve often been asked about what bits are useful when setting up the Raspberry Pi, so I’ve put in a load of links here to places that might help. It’s a bit random, needs formatting and tidying up. At least I’ll be able to find the stuff easily. Some of the stuff has been directly culled from their respective websites. I’ve tried to reference these directly in places where I can remember. Here we see the basic display showing the title and time. 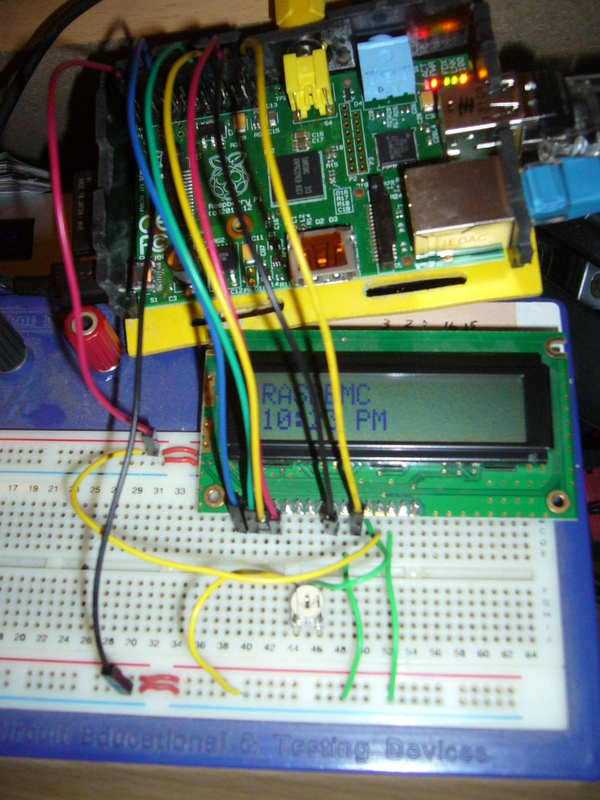 Just a few connections between the LCD and the GPIO connector. Isn’t it great when you uncover even more depths. I know that people have been to this point way ahead of me, but what a pleasant surprise to discover just how feature packed and useful RaspBMC is. Remote control interfacing is handled by a Flirc USB key which can simulate keyboard presses from any remote control. It has to be configured on a Windows PC first (which only takes a matter of a few seconds) and then it’s ready to plug into the Pi. I’ve also got Yatse running on an Android tablet. Lots of success in a very short time – just the way I like it!